In partnership with Indigo, IEM is equipping the city of Metz in France with 270 PrestoEuropa pay and display machines installed in 2 phases, 180 of which are already in place since early 2017. Smart city, the community has customized its machines to educate users to go digital. The aesthetics of PrestoEuropa and its ability to integrate in a very constrained urban environment are of particular importance in the city of Metz (candidate for selection as a UNESCO World Heritage city). In addition, the different options of this pay and display machine have seduced the city of Metz, which advocates switching to digital in its offer of public services. Since entering the registration number has become mandatory for taking the parking ticket, with a gradual transition towards full computerization of Innovative parking tickets, the installed pay and display machines offer coin payment and payment by contactless bank card only; which makes Metz a forerunner since most communities choose contactless and contact payment. 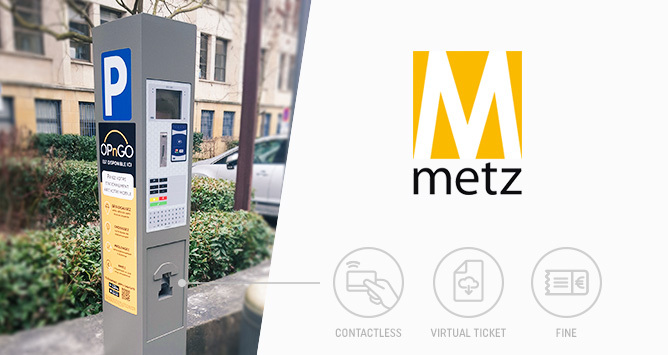 As a pilot city for the new regulation, Metz is also equipped with intelligent pay and display machines with new features and is one of the cities that are already prepared for the new on-street parking regulations that will come into effect on January 1, 2018. Thanks to its alphanumeric keypad and payment by credit card, PrestoEuropa will enable cashing the post-parking payment by simply entering its number.